B. 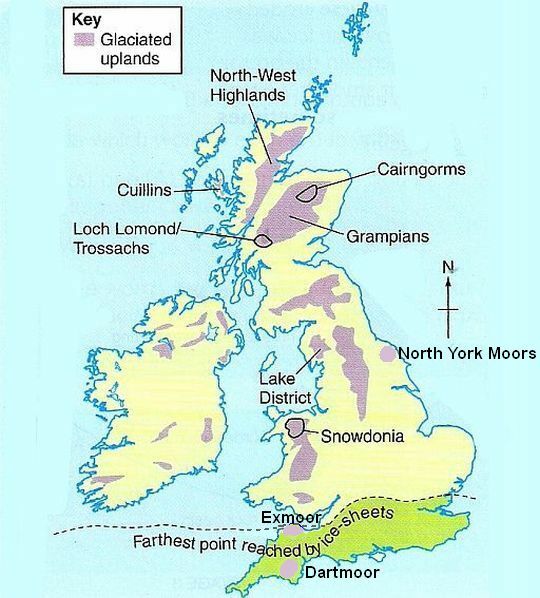 Location of glaciated uplands. C. Two processes of glaciated erosion. ................... that was eroded by the action of snow and ice. 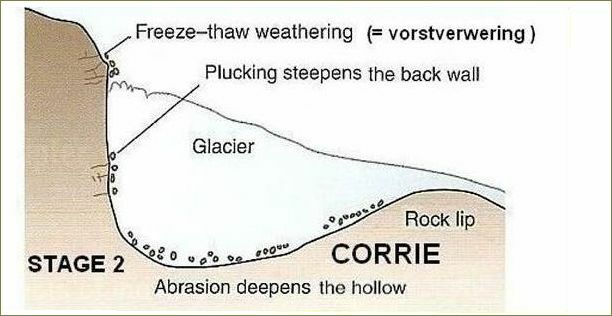 ................... Corries are found in areas where glaciers once formed. ................... In Wales they use the name cwm in stead of corrie. ................... The French name cirque is also used by some people. the mountains and was gradually squeezed into ice. then squeezed out and forced down the mountainside. This was the starting point of a glacier. to form a much deeper, steeper hollow. This is a corrie ( kaar). hollow was weathered by freeze-thaw action. Then, when the meltwater froze onto the rock, plucking took place. At the lip of the hollow the ice was less thick and so did less plucking. the rock lip was abraded, making it smoother. tarn (corrie loch) .... kaarmeertje (Nederlands) .... botnsjø (Noors). For example: Red Tarn on the eastern flank of Helvellyn. .... ( = a sharp ridge of rock separating two corries). them was plucked away to form a sharp ridge, shown in figure below. This sharp ridge is called an arête ( graat). 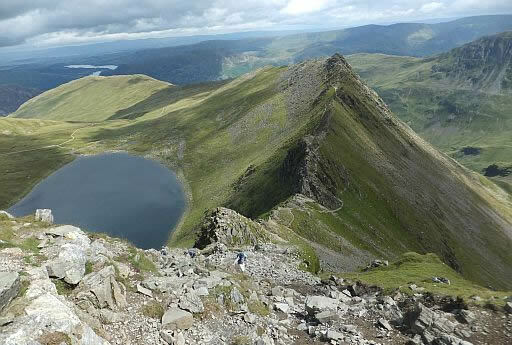 For example: Striding Edge near Helvellyn in the Lake District. was plucked and weathered into a sharp point called a pyramidal peak. For example: Snowdon, Mont Blanc, Matterhorn and Mount Everest. 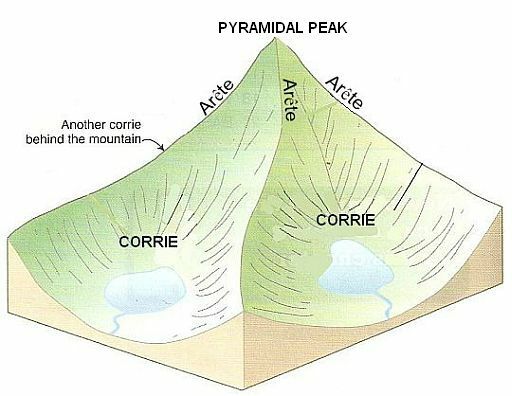 • Fig: Corries, arêtes and a pyramidal peak. • Vanaf Helvellyn kijk je hier neer op het kaarmeer Red Tarn en de graat Striding Edge. 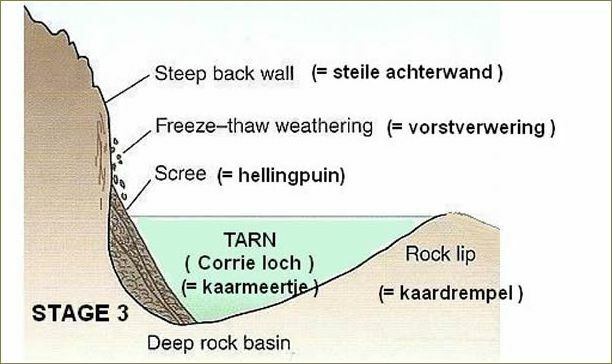 ...(scrambling = klauteren = naast de voeten ook je handen gebruiken). in upland areas (forming the typical U-shaped profile of valleys). the ice, before being dumped when the glaciers retreat. Till is one type of moraine. Erratics originated as moraine. .................. tthe landscape, ripping out rocks when it moves). broad flat floor (see figure). and is called misfit stream ( hongerrivier). freeze-thaw weathering that has taken place on the valley sides above. 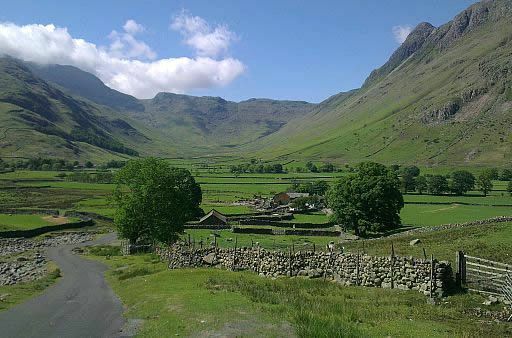 For example: Great Langdale Valley in the Lake District. 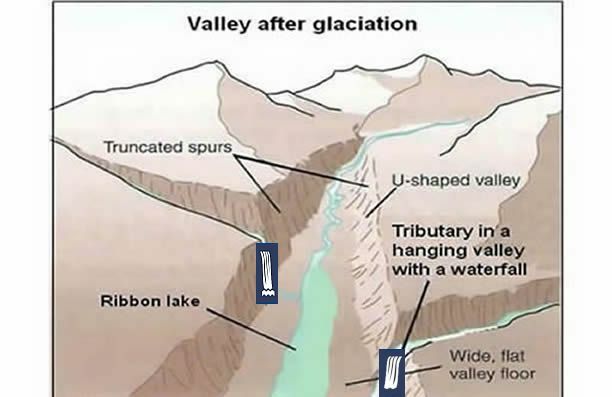 • Fig: The formation of a . U - shaped valley. less powerful. 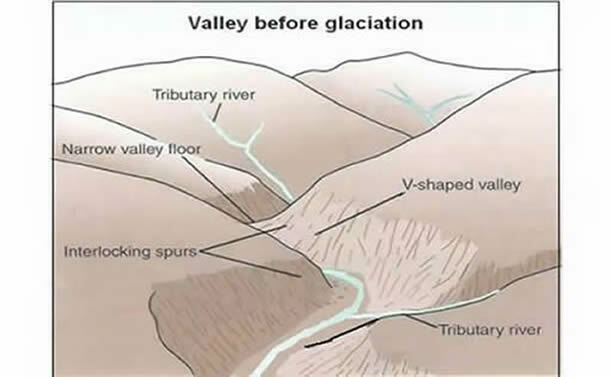 They could not erode their valleys as deeply as the main glacier so, where they met, the floor (dalbodem) of the tributary valley (zijdal) is much higher than the floor of the main valley. .................. Hills that a river meanders around in a V-shaped valley. ........ ( = a long narrow lake found in a glacial trough). .. was softer and more easily plucked and abraded. ...moraine (morene) and often forms ridges (wallen). ...lakes built up behind them. ...These moraine-dammed lakes are also examples of ribbon lakes. ..................................................................... been eroded by ice. moving ice) and only moving ice does not affect the British Isles today. must study it in detail. that can be clearly seen today. This evidence of glaciation is most obvious when you look at our uplands. ( = alle land above the upper limit of enclosed farmland . move down the mountainside like a slowly-moving "river" of ice. • Ice covered land as far as the Bristol Channel. ... ingetekend als uplands. Dat is een domme fout. ..DDeze drie gebieden zijn ook typische uplands. ... North York Moors is ook vergletsjerd geweest, maar Exmoor en Dartmoor niet. Between a glacier and the rock underneath is a thin film of meltwater. This water sometimes freezes, so the glacier becomes attached to the rock. of rock. This powerful process is called plucking ( plukken). rock surface as the glacier moves. This slower process of erosion is called abrasion ( abrasie).